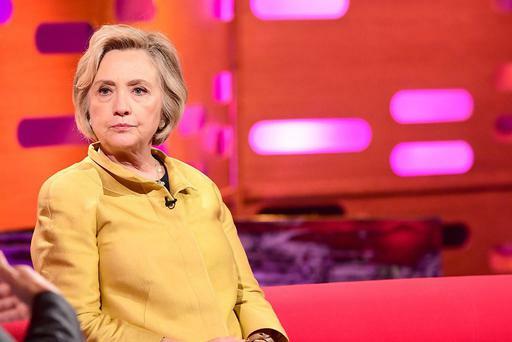 The Late Late Show’s “exclusive” interview with Hillary Clinton from a few weeks ago no longer looks quite so exclusive, given she’s been roaring around the chat show circuit like a Formula One car ever since her latest book came out. Tonight it’s the turn of The Graham Norton Show (BBC1, 10.35pm). No disrespect intended to Ryan Tubridy, but this is likely to be a less sober affair, particularly if Hillary partakes of a glass or two of the house vino. There’s a decent support line-up too: Jeff Goldblum, Jack Whitehall and Gerard Butler. On The Late Late Show (RTE1, 9.35pm) itself, guests include Graeme Souness and Gregory Porter. My abiding memory of the late magician Paul Daniels, who made himself disappear last year, will always be his infamous breakfast TV appearance alongside a grieving Brian May and Roger Taylor a week after Freddie Mercury’s death. When asked for his thoughts on the great Queen frontman’s sad demise, Daniels began: “Well, I was never a fan of the music, but…” Graciousness and a sense of humanity clearly weren’t attributes he kept in his little back of magic tricks. Paul Daniels: My Life in Magic (Channel 5, 10pm), featuring contributions from fellow magicians including David Copperfield, Penn & Teller, is likely to be a more sympathetic look at a man who never perfected the illusion of seeming nice. The revived Cold Feet (UTV/ITV, 9pm) comes to a bittersweet end for now with the gang chewing over the previous night’s excruciating 50th birthday party. Expect emotion aplenty. One of Us (Netflix, from today) demonstrates once again that documentaries are becoming as important to the streaming service as big-budget TV series. This absorbing new film from Heidi Ewing and Rachel Grady, who made Jesus Camp, focuses on three people attempting to break away from the obsessively secretive Hasidic community. What sets Travel Man (Channel 4, 8.30pm) apart from other celebrity travel shows is that it doesn’t lay all that “journey of discovery” nonsense on with a trowel. Richard Ayoade and his companion-of-the-week aren’t interested in learning or informing; they’re out to have fun and they want us to have fun watching them do it. Tonight, Ayoade is accompanied by Matt Lucas on a 48-hour jaunt to Rome, and they make for a cracking double-act. The BBC seems to have finally realised that some viewers want more from Saturday night television than just talent competitions and game shows, hence the new appetite for scheduling grown-up drama series that might otherwise have gone out on a Sunday. The latest is Gunpowder (BBC1, 9.10pm), a three-part retelling of the The Gunpowder Plot with Kit Harington from Game of Thrones leading a first-rate cast that includes Liv Tyler, Peter Mullan and Mark Gatiss. It’s 1603: Elizabeth I is dead and King James of Scotland has parked himself on the throne. With England at war with Catholic Spain, the country’s own Catholics are being persecuted and priests caught saying mass are punished with death. Hugely promising. Front Row (BBC2, 7.30pm), the television incarnation of the popular BBC Radio 4 arts show, has taken an awful kicking across the water, with critics and fans of the original claiming the BBC has given the presenting jobs to TV faces who don’t appear to know much about the works being reviewed. That said, the series has been redeemed somewhat by the quality of the guests, who tonight include Philip Pulman and Armando Iannucci. Whether or not it says something disturbing about human nature is open to debate, but there’s no doubt that a lot of people are fascinated by serial killers. Few are more grotesque than John Wayne Gacy, aka The Killer Clown (Sky Living, 9pm). One of the most prolific murderers in history, Gacy was a well-liked member of his community who killed 33 boys and young men. Coming slap-bang in the middle of the 70s disco craze, Meat Loaf’s bombastic Bat Out of Hell was an unlikely mega-seller. In the reliably thorough Classic Albums (Sky Arts, 8pm), the big man, born Marvin Lee Aday, reveals what went into the making of one of the most successful LPs of all time. We’ve seen a number of revivals of old favourites this year, not all of them entirely successful. Robot Wars (BBC2, 8pm), however, has stuck, largely due to the decision to not to mess too much with a winning formula… well, except for replacing Craig Charles with Dara O Briain and Angela Scanlon. While the new series features some fresh features (Robot Redemption, whatever that is, and the self-explanatory Ten Robot Rumble), it’s essentially the same satisfying combination of ingenuity and mayhem. At a time when public taste in comedians seems to run to the safe, The History of Comedy (Sky Arts, 10.20pm) is a reminder of when comedians were considered subversive and dangerous by the establishment. This episode looks at how groundbreaking stand-ups like Lenny Bruce and Red Foxx risked their careers (and sometimes their liberty) by pushing back against censorship. Apparently, this year’s run of Antiques Roadshow (BBC1, 8pm) features one find that knocks its owner for six when they discover how much it’s worth. But I imagine the series is saving that ‘til last. In the meantime, the experts feast their eyes on the flashiest jewellery they’ve ever encountered. Personally speaking, I’d rather spend a couple of hours watching two flies fight over a cube of sugar than watch motor racing — but hey, it’s a free world. For the moment, anyway. Live Formula One (Channel 4, 7.35pm) vrooms off to Texas for the United States Grand Prix, with Lewis Hamilton having won four out of the five races on this circuit (it says here, anyway). Coverage runs until 10.10pm and then there’s an hour of discussion and analysis with Steve Jones, David Coulthard, Eddie Jordan and others.